One of our missions at EngraveJoy is to make a difference in our local communities and groups around the world. 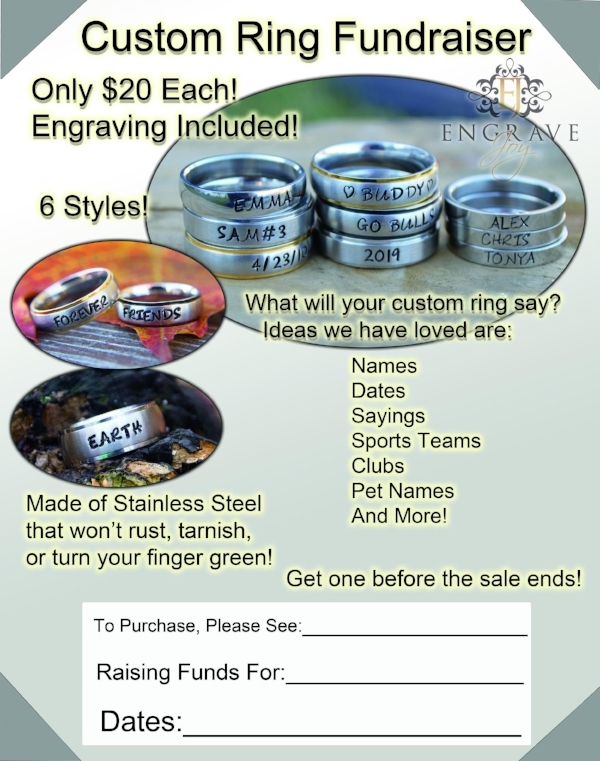 And we found we could do this by offering a fun and unique fundraiser that works with almost all ages and demographics using engraved rings. Most of the information is listed below, but please do not hesitate to contact us if you have any questions. Your profit is 40% of every product sold. And we offer a bonus ring to the person selling, should they sell over 6 rings. It's an easy way to get them motivated! We tried to give the best margin possible, while being as simple as possible. So- what your group pays is just the cost of the rings themselves, and the return shipping of display kits-(if those are requested). There is no cost for our posters or order packets as well as, any shipping from us. No hidden start up fees, or processing fees. Other fundraisers may offer products with a higher % profit, but we pride ourselves with a strong selling product, an amazing rewards program with no hidden fees! With a product kids/teenagers can get excited about, this is a fundraiser all generations can get behind. How do we ship the product and promotional material to you? All original order packets, posters and display kits are sent via USPS, FEDEX, OR UPS WITH TRACKING. Orders to Alaska and Hawaii are shipped USPS. All finished orders are shipped FREE to the organization via USPS with tracking and insurance. Shipment is made no more than 2 weeks after we receive the order forms and payment must be made before we send custom engraved rings out. 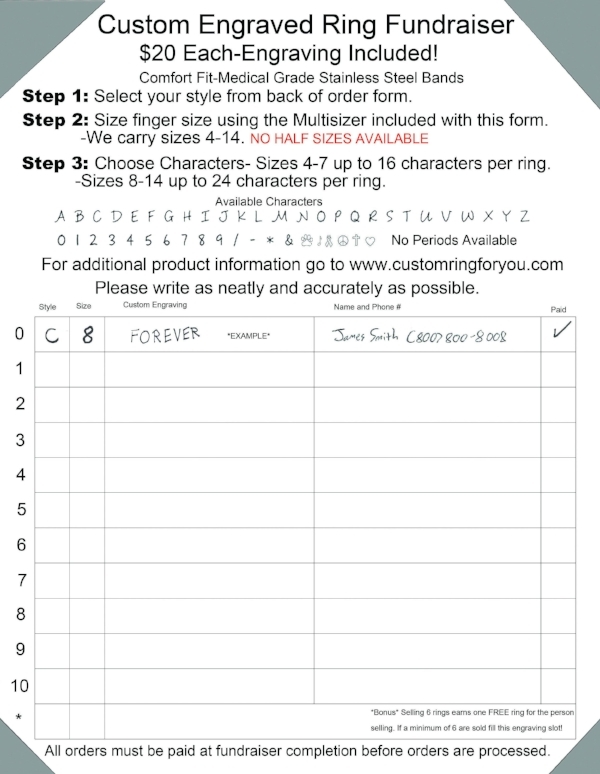 Each order form is packed separately with the buyers name labeled on a sleeve that holds each ring, distribution is easy and there is no confusion for anyone involved. What happens if there is a problem with one of our rings? We take ring engraving quality very seriously, every ring undergoes inspection at least 3 times before it leaves our doors. However though minimal, sometimes mistakes happen, should we not be able to read the order form correctly or some other issue; and we send out a customized product that is wrong. Then we will replace and ship the ring for free to the buyer. In the event where we cannot read the writing, or something that we simply cannot do, we will call the buyer directly and resolve the problem. There is no need for organization to fix problems or be involved which means less headache for you. We understand that a bad fundraising experience can look negative on the sellers, and we offer exceptional customer service to help make your sale successful. How do we take payment for fundraisers? We take payment via check mailed to ENGRAVEJOY 261 Powder Spring Rd, Groton, VT 05046. When selling the product, make sure any checks from the ring fundraiser buyers are written out to the school or ogranization. We ask for 1 check by the organization with the 40% profit removed. So- for 10 rings sold- you would send us a check for $120 or $12 per ring. Your profit the sale of 10 rings would be $80 Payment can be made electronically if chosen, please ask us for more details. Here is a preview of the front and the back of our order forms for Spring 2018. We also have added Posters for seller convenience, and have attached a photo below, these are 11x14. Should you decide to run our fundraiser, we will send as many as wanted to your school or non-profit.